Some people can easily justify dropping $200 for Red Five's X-Wing or $140 for the Millennium Falcon. 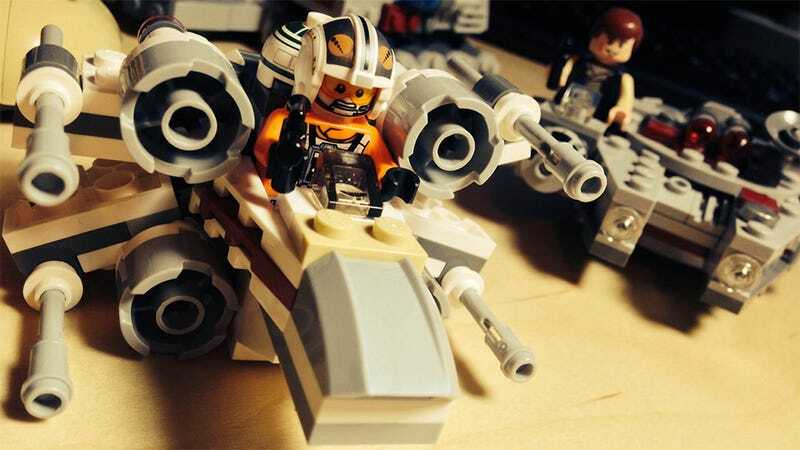 For the rest of us, LEGO Star Wars Microfighters and a healthy imagination shall have to suffice. I wasn't impressed with the Microfighters iOS game, but I was definitely impressed when I saw LEGO Star Wars-branded sets that weren't horrible priced at $9.99 at my local Walmart. I've done my best to avoid getting too hooked on the Star Wars side of LEGO for years, fearing my collector's instinct would kick in and I'd find myself scraping together$400 for the Death Star. Contained in their own little corner of the LEGO Star Wars universe, the six vehicles in the Microfighters line gives me a chance to collect without going broke. I appreciate this. There are six vehicles in the series, each packaged with a minifigure driver. Build time for each is 5-10 minutes, making for a relaxing little midday break during work hours, not that I would know anything about that. My first purchase, the X-Wing Fighter's iconic profile makes recreating it in tiny LEGO form easy. It's instantly recognizable as a classic Star Wars vehicle, even without the orange jump-suited pilot and the R2 unit in back. Another unmistakable silhouette, recreated frugally in tiny LEGO form. There is no other vehicle quite like the Falcon, and the charmingly roguish Han Solo minifigure is easily worth a ten spot on his own. Aren't you a little flat for a Star Destroyer? This one features a genius build, but the overall look is Imperial crew member riding a slice of space pizza — not necessarily a bad thing. Ah, that's more like it. The weird glass cockpit, the adjustable wings — there's no mistaking this for anything other than a ship that's going to explode as soon as the Rebels show up. Honestly I'm not invested enough in the whole Clone Saga to be able to comment on the accuracy of this Turbo Tank. I can say that the Star Wars I remember would never have a vehicle called the Turbo Tank. I cannot decide if that's good or not. It does remind me of a Cobra tank, so I give it a thumbs up. An adequate likeness of a vehicle I despise. Comes with a stupid droid minifigure. Makes me feel like I've been cheated out of a real toy in the process. Despite hating one of the vehicles and not being familiar with the other, overall I'm quite satisfied with the Star Wars Microfighters line. They're quite small, but sometimes that's an advantage. Could a full-sized LEGO model do this? No, they could not do those things. Not without similarly upscaled ponies and Transformers. Large, expensive models are lovely, but tiny builds can get the point across just as well, all without affecting your freaky anime love life.